Item No.328 was another very interesting binder with excellent examples of passports and related documents – in this case of Dr. Wilhelm Solf (5 October 1862 – 6 February 1936). Solf was a German scholar, diplomat, jurist, and statesman. He joined the German Foreign Office (Consular Service) on 12 December 1888 and was assigned to the Imperial German Consulate General in Calcutta on 1 January 1889. He joined the Colonial Department of the Foreign Office (Kolonialabteilung des Auswärtigen Amtes) and in 1898 was assigned as a district judge in Dar es Salaam in German East Africa for a short period. Wilhelm Solf, at age 38, became the first Governor of German Samoa on 1 March 1900. 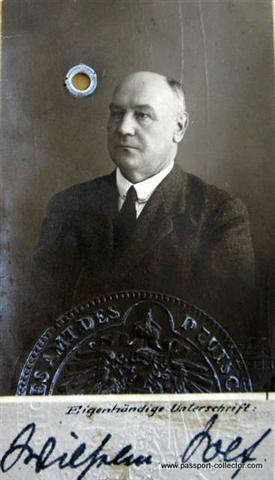 After his return from Samoa, Solf became Secretary (Staatssekretär) of the German Colonial Office (Reichskolonialamt) to 1918, traveling extensively to the German protectorates in West and East Africa in 1912 and 1913. The outbreak of World War I caused Germany’s colonial possessions to be invaded by Britain (including Dominions), Belgium, France, and Japan. With the defeat of Germany imminent and the likelihood of revolution growing he was appointed what turned out to be the last of the Imperial Foreign Ministers in October 1918. He resigned his post as Foreign Minister on 13 December 1918 with the onset of the German revolution. Between then and 1920 he was Vice President of the Deutsche Kolonialgesellschaft. From 1920 to 1928 he served as the German chargé d’affaires and then ambassador to Japan; his tenure proved to be fruitful, as he was instrumental in restoring good relations between the two wartime enemies, culminating in the signing of the German-Japanese treaty of 1927. On Solf’s return to Germany and retirement from government service, he became the Chairman of the Board of the Deutsches Auslands-Institut based in Stuttgart. He supported the election of retired Field Marshal Paul von Hindenburg as German President.Wilhelm Solf was married to the former Johanna Dotti, who later formed the anti-Nazi Frau Solf Tea Party get-togethers with their Samoan-born daughter So’oa’emalelagi, also known as Lagi. Solf was the author of Weltpolitik und Kolonialpolitik (Foreign policy and colonial policy, 1918) and of Kolonialpolitik, Mein politisches Vermächtniss (Colonial policy, my political legacy, 1919).